Add a sophisticated and stylish ambiance to your event as your guests keep cool with these delightful folding silk fans. A special classy favor designed to add a touch of sophistication to an outdoor event, a beach themed or summer garden occasion. The fans are made from a light colored wood and feature a stunning intricately carved design. They have a collapsible and expandable ribbing structure that opens to reveal a delicate white silk fan. 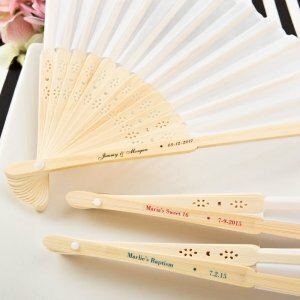 These lovely fans make thoughtful gifts when you personalized them with a clear sticker, showcasing your guest's name and the date of your special event. Keep your guests cool and relaxed, no matter what the temperature is, with a fan that is uniquely designed for your event! my tex color is turquoise , what do you mean with the top color? Please disregard the top color as you can only choose a text color for this item. Hi. Do you have the Malibu blue color for the embroidery? The text color available for this Personalized White Silk Folding Fan Favor is only Turquoise. On the personalized silk white fan can the dot be taken off the custom part? I'm sorry, the dot when personalizing this Personalized White Silk Folding Fan Favorcan't be removed that's to actually separate text line 1 and 2. Is the writing engraved on the fan... or is it a sticker?? 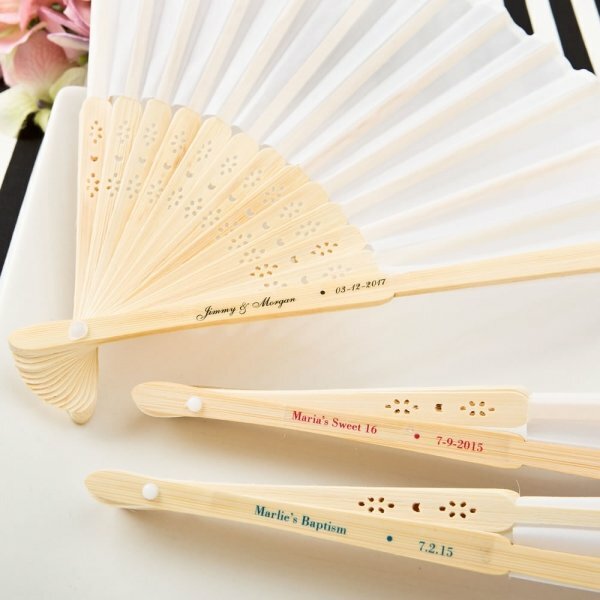 The personalization of this Personalized White Silk Folding Fan Favors are stickers.